It’s so easy to get stuck in a rut when it comes to vegetables. You’re in a hurry, and you need to add vegetables to your meal, so you throw together your old standbys. Maybe it’s steamed veggies, fresh veggies with ranch, a salad. It’s something that you end up having repeatedly. Even when you rotate them, so you don’t have the same thing every day, always having steamed vegetables gets old. Every once and awhile it’s good to have a new veggie recipe to add to the rotation. And this one hits it home – traditional Asian seasonings on fresh broccoli that’s roasted to perfection. It doesn’t get better than this. Broccoli is a great vegetable. It’s readily available year-round, both fresh and frozen, but it’s peak season is in the spring. It’s bright green color indicates that’s it’s packed with vitamins and minerals. Broccoli is one of the best sources of vitamin K.
Your body uses vitamin K to help absorb calcium into the bones and to help form blood clots. Broccoli is also a great source of vitamin C and folate as well as a wonderful way to add some fiber in your diet. One of the key things to keep in mind when you prepare vegetables, is that you shouldn’t over cook them. Steaming is a common way of cooking veggies, but the major disadvantage is that most of the time the veggie ends up overcooked and all those vitamins and minerals end up being drained off in the water. 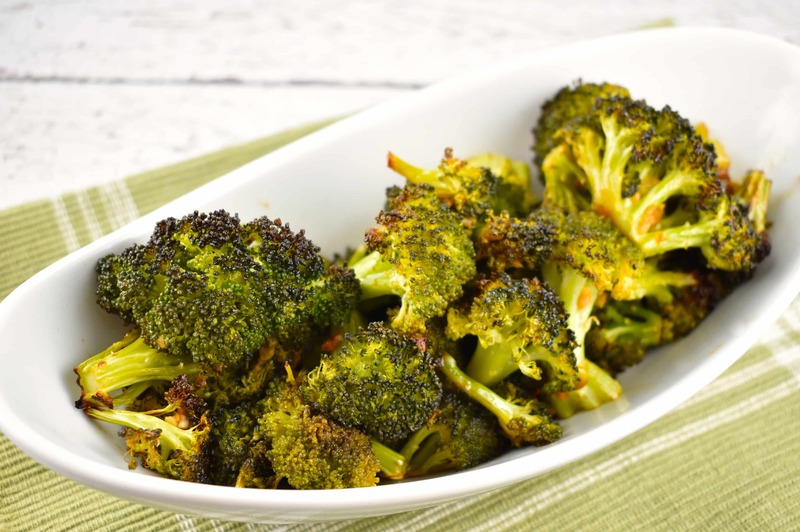 Quick Roasted Broccoli is the perfect way to end up with tender and delicious veggies, without removing or destroying the vital nutrients that the broccoli contains. Quick roasting veggies is a great way to prepare them. I love how easy, quick and simple they are. Just wash and chop the veggies, then season them on the sheet pan and roast until tender. You don’t end up with very many dishes, the veggies taste great and while they’re cooking, you’ve got just enough time to finish preparing the rest of an incredibly tasty meal to go along with them. But it’s not just the roasting that makes this broccoli amazing. The salty soy sauce, bold garlic and smoky sesame oil is the perfect combination to make this quick roasted broccoli truly divine. Anytime I make this, I’m sure the kids will gobble their veggies down because it’s just so incredibly tasty! It’s so important to make sure that you’ve got plenty of veggies when you’re on Weight Watchers. Most vegetables and fruit are zero points, so you can fill up on the nutrient and fiber rich vegetables without eating all your points. You get more quantity for a serving when it comes to vegetables, so you feel as though you’ve gotten more to eat. When you don’t feel deprived and have plenty of fiber to help keep you feeling full longer, you’ll be more successful. This Quick Roasted Broccoli with Soy Sauce is a winner. It’s quick and easy but very low in points but bursting with flavor. A quick and easy way to enjoy a healthy serving of broccoli, this dish makes a wonderfully flavorful side dish to your favorite meal. Preheat oven to 450 degrees. Like a large baking sheet with parchment paper. Place broccoli in a large bowl. Whisk together the oils, garlic, and soy sauce, and pour over broccoli. Toss until every coated. Transfer to baking sheet. Place in oven and roast until broccoli is browned on the edges, about 20 minutes. What if I didn’t not have sesame oil? You can make it with olive oil, but the flavor will not be the same. Toasted sesame oil has a very distinct flavor, and the whole flavor profile of this recipe would change if you didn’t use it. I use the same ingredients in this recipe for bok choy and it’s delicious!